Murren in Switzerland is most famous for its starring role in the James Bond film On Her Majesty’s Secret Service. At the end of the 1960s, the film-makers were taken by the futuristic revolving restaurant on the Schilthorn mountain and the scenes involving the imaginary Piz Gloria were shot there. Murren is the highest, continually inhabited village settlement in the canton of Bern and lies on a terrace at 1,650m, high above the Lauterbrunnen valley. A double-cable ropeway leads up onto the plateau from Lauterbrunnen, while a cableway runs from Stechelberg, past turbulent waterfalls and craggy rock faces, into the centre of the car-free village of Mürren, and further to the Schilthorn at 2.970. The Village – Murren in the Jungfrau region of Switzerland is one of the most beautiful villages in the Alps. Perched on the side of the mountain, it really is picture postcard material. Car free and maintaining snow on the village paths throughout the winter it doesn’t get more attractive than this. The View – with views across the valley to the Eiger (3970m) , Monch (4099m) and Jungfrau (4158m) mountains, a stay here takes your breath away. The panoramic doesn’t fail to impress each time I visit. The new Thrill Walk at Birg. Not for the faint hearted, this new 200m metal path clings to the side of the mountain at Birg, wrapping around the mountain from its access at the back of the terrace behind the Birg restaurant, to the front side looking down the mountains. One section is just a thin metal wire…don’t look down! 007 –The James Bond Film, ‘ On Her Majesty’s Secret Service’ was filmed here – watch the movie and see the revolving restaurant at Piz Gloria still looking remarkably similar. The revamped Bond Experiencea within the Piz Gloria building is really fun to spend some time in. The skiing – The ski area doesn’t look huge but with it has something for everyone. The top steep sections down to the narrow Kanonenrohr run between the rocks; the blue runs through the trees down to the village; the lovely long s-bends down to Lauterbrunnen (when snow allows) and the easy nursery slopes in the middle of the village. The restaurants – choose from the old Suppenalp restaurant just above the village (you can even stay the night there), so cosy inside, or the little hut below the top of the Schiltgrat chair for hot chocolate with rum and cake, the lovely terrace at Birg for lunch with a view, or ski down to the village and sit outside the Hotel Jungfrau on its terrace and watch the beginners slopes under the sunshine. Again plenty of options for all tastes. 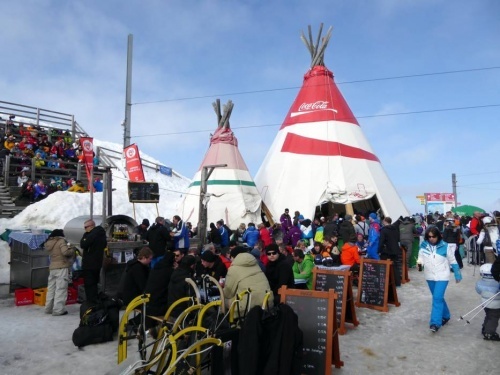 The Inferno – each January over 1,800 skiers descend on the village to take part in The Inferno. A huge 14.9km downhill race (including several uphill sections) where competitors are set off at approx. 10 second intervals. Celebrating its 75th anniversary in 2018, there are plans for a new Inferno team event, the ‘Sir Arnold Lunn Cup’ where the competitors will start at the same time. 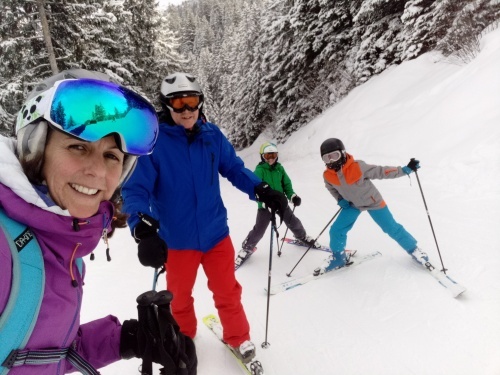 History – British ski pioneers the Lunns still have family living in Murren. Sir Arnold Lunn organised the first slalom race here in 1922, a few years after his father Sir Henry Lunn first brought winter holidaymakers to the village. 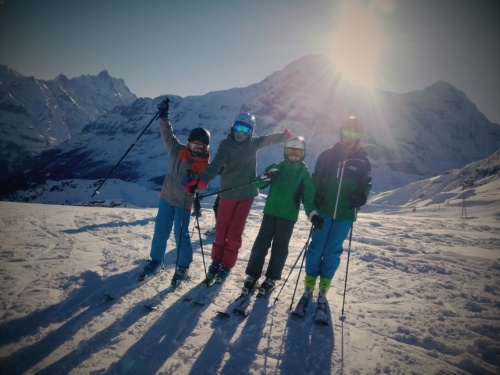 The Kandahar Ski Club, which was founded in Murren in 1924, is still going strong and runs a regular ski race training programme for children and is fundamental in the number of British taking part in the Inferno ski race each winter. Access – as Murren is car free, all cars park in Lauterbrunnen in the valley. Why not travel by train? All the airports close by – Basel, Bern and Zurich offer train travel to Lauterbrunnen and then connect with the cable car and small cog railway to the village itself. Not just for winter – Murren in summer is stunning too. Covered in wild flowers, perfect for short or long hikes, try the via ferrata. Take the train down to Interlaken for some shopping or a swim in the lake. 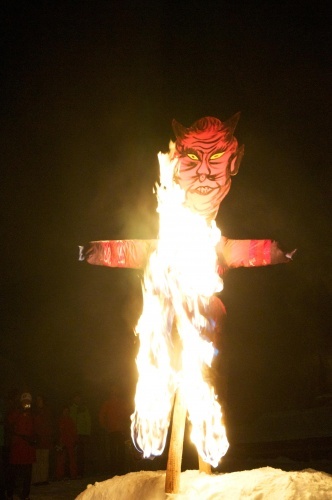 Last weekend the tiny Swiss village of Mürren came alive for the 74th Inferno Ski Race. PlanetSKI was in the start gate. 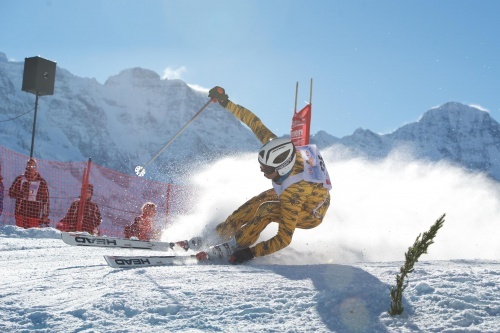 The amateur ski race attracts over 1,850 participants from all over the world; around 250 enter from the UK alone. Starting just below the top of the Schilthorn, renown for the James Bond film, “On Her Majesty’s Secret Service”, and including at least one uphill climb on skis, this year’s 7.6km race finished in the centre of Mürren. 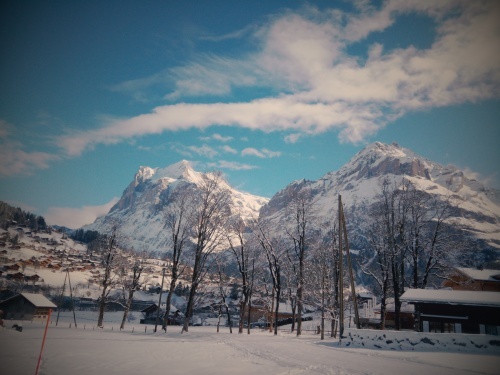 On a good snow year the full 14.9km course ends in Lauterbrunnen down in the valley. Checking out the ski area in the days running up to the race, there was plenty to ski on in Mürren although the run to Winteregg below Mürren was a bit patchy and most of the recent fresh snowfall had gone. On a day trip over to neighbouring Wengen we were able to ski untracked powder down to Grindelwald. Back to the race – we had a beautiful clear day, just perfect conditions. This year’s winning time was 7.10 minutes by racer with start number 17. My time of 11.45 minutes as racer number 1381 earned me a ‘Bronze award’. Special thanks to the DHO for lending me the streamlined catsuit! The inferno parties are legendary- think beer-fest with live Swiss bands and teens to retirees all enjoying one huge sports hall with table dancing and more. It creates a very special party atmosphere! Check out more on the Inferno race and festivities here. We left Mürren, after a short weekend visit, to go back to its beautiful, sleepy self… until next year when the devil will be burned again before the 75th anniversary Inferno ski race – already in the planning with a new pro-am style team race. 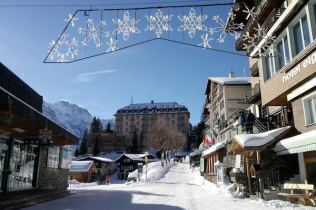 Check out the website of the resort of Muerren here. 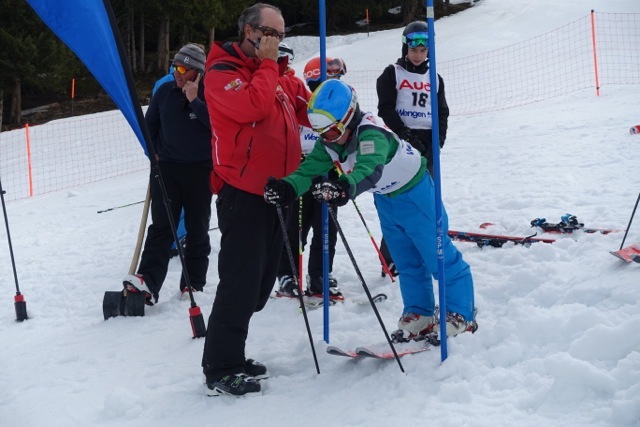 Vanessa and family take a Swiss spring break and take part in the AICC Junior Interclub Races. 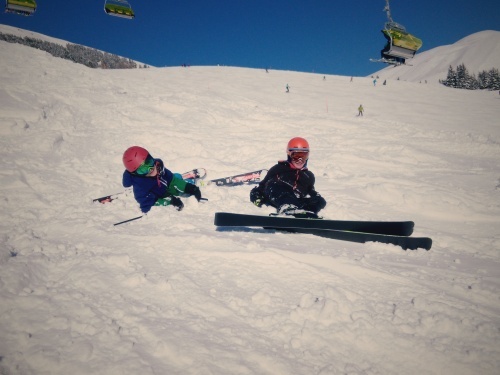 A week before the Easter holidays we decided to book a last minute spring skiing break. A combination of points saved on Avios and cheap flights on off-peak days and times made it all possible. Then an apartment with a flexible booking period sealed the deal, allowing us to secure five days and nights on the slopes.Having a godfather who lives in a ski resort gave us the perfect excuse to visit. 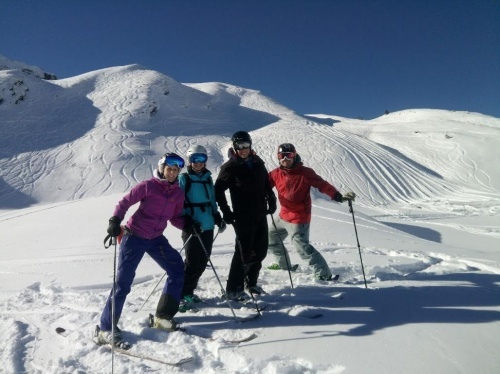 We knew the snow was still excellent in the Alps and there was a clear five-day window. So we arrived in Wengen by train from Basel airport, laden with Easter chocolates and all the kit needed for a short (ish) ski holiday. The ‘godfather’ conveniently has a ski rental shop (Ski Set Wengen) in the resort centre, so kitted up early doors on our first morning we were swiftly heading up the Mannlichen cable car for our first runs of the day. The snow cover was still perfect and all but two chair lifts in the immediate area were open. Skiing down to Brandegg, on the way towards Grindelwald, the runs were soft and we were excited to see the blue run down to Grund train station was also open. This became our secret ski run – each of the three days we skied the Wengen/Grindelwald area, we managed to ski right down to the resort, despite the valley looking beautiful and green. We’d hoped to connect over to ‘First’ above Grindelwald and try out the ‘First Flyer‘, a lift that carries you from ‘First’ to Schreckfeld, 50m above the ground and at speeds of up to 84 kmph, but unfortunately that ski area had closed – one for our next visit. On our hottest and last day, the highest pistes below the Eigernordwand chair were corrugated and bone shattering at 9am. Down our secret run, otherwise known as no 22, the pistes were just softening by 10am and super quiet, we loved it! This hot spell over the Easter holidays was brought by southerly winds, which dropped Saharan dust across much of the Alps; we didn’t have the dust but we did have some very strong winds. Our fourth day found us rushing to catch the 8.24am train to take part in the Junior AICC races (Amateur Interclub Team Championships). We had discovered these were taking place during our stay, and along with another family we combined our children to make two teams. 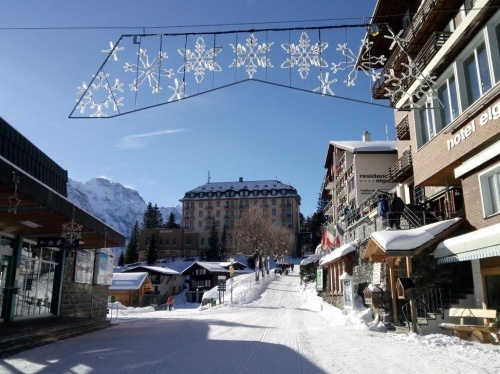 The event this spring was supposed to be hosted by the Kandahar Ski Club in Murren, but some confusion over dates meant that the Wengen based English Ski Club, the DHO(Downhill Only Club) stepped in. 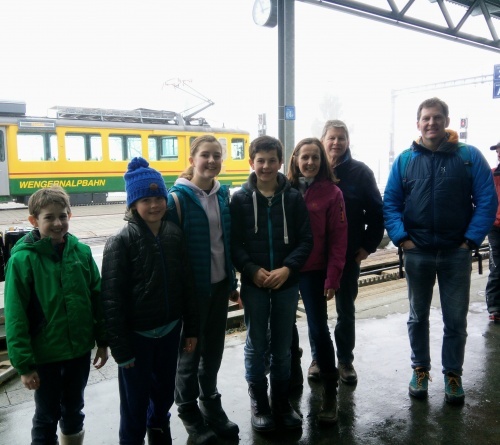 Having arrived by train to Kleine Scheidegg above Wengen, all 36 children signed up were ushered into the restaurant along with accompanying parents. Once there we were told that due to the winds, most of the lifts in the resort were closed and that the proposed route on the top section of the famous Lauberhorn run would have to be moved. An hour later and 12 teams skied down to the ‘Bumps lift’ (except the Bumps T-bar lift had been packed away over a week previously). Each team skied a short GS course in teams of three, and between runs had to walk back up the course. It was a funny sight, but everyone helped each other with the older skiers carrying the younger ones’ skis back up the mountain. It was great fun and for a day, which looked like it would be scuppered by bad winds, our children said it was one of the best days of their holiday. They made new friends and were made to feel welcome by the many regular young ski racers taking part. 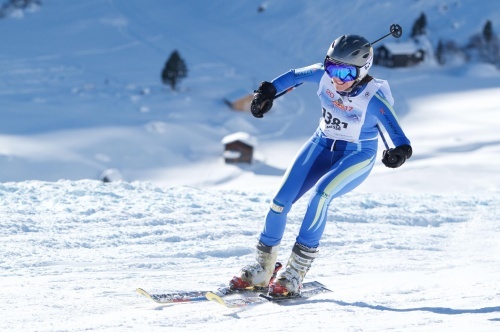 Each year a different English ski club takes on the organisation, so the events move around Europe with amateur ski racing for both adults and juniors. 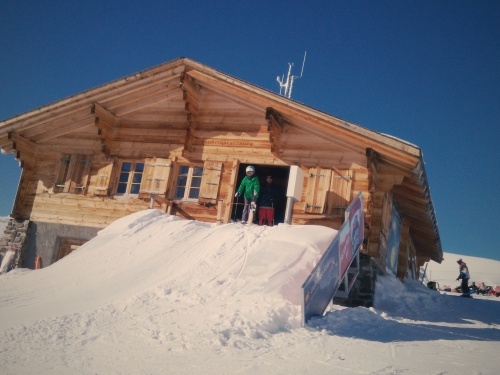 Next year it’s being hosted in Alpbach… fancy signing up?